Let the plumbing-geek help you with your home plumbing projects. Who is a plumbing-geek? Anyone that finds beauty in a well-functioning plumbing system. That person you know who actually begins DIY plumbing projects when everything was working. The do it yourself plumbing guru everyone calls for advice, they are plumbing geeks. Because of plumbing's utilitarian nature, function is always more important than form. 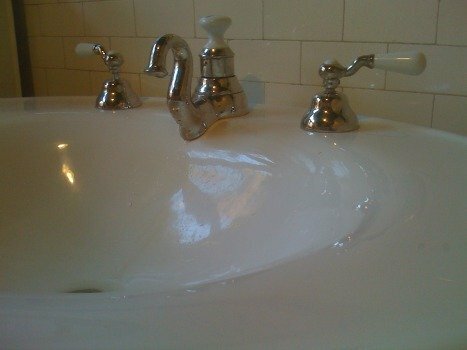 However, beauty and function are always attainable in plumbing. One of my first vintage plumbing restoration projects. Pretty isn't it? Plumbing should be essentially out-of-mind. You may not notice good plumbing but you always notice plumbing that doesn't work as it should. For example, you should NEVER have to explain to a guest how to use your plumbing... "just jiggle the handle three times." Plumbing is fundamental to our lifestyle. Yet few people really understand the plumbing systems in their homes. Our mission is to help people understand the plumbing systems that serve them, in order to promote safety, sanitation, and knowledge. These are important for all home owners, but especially important for the DIY plumbing handyman. You may only be concerned about your drippy faucet, unaware of other unsafe conditions that could make your family sick if left unattended. Plumbing codes are based on physical laws, the essential aspects of the plumbing code have not changed much in 100 years. Whether you have modern or vintage plumbing, your should have confidence that it's safe, sanitary, and efficient. What's good plumbing? Plumbing is utilitarian... functional. You can compare plumbing that works well to a computer that runs well. When both are at their peak, you just "use" them without thinking about it. You shouldn't see either your plumber or computer tech very often if they've done their job right. I've been a Portland plumbing contractor for over 25 years, as owner of Brian's Plumbing Works. After 30 years as a journeyman plumber, I've seen the good, the bad, and the ugly side of plumbing. 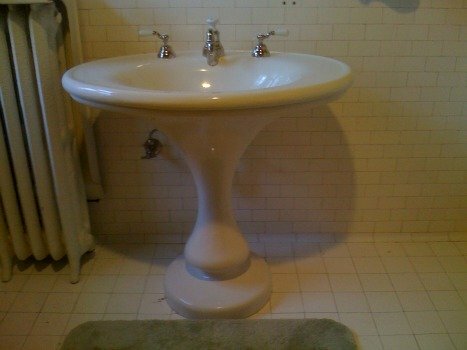 I've had the pleasure of restoring the beauty and function to vintage plumbing fixtures in many old homes in the Portland, Oregon area. In doing so, the original interior architecture of the homes has been preserved. Many of these customers were advised by other plumbers that a remodel was unavoidable because of the age of the fixtures. The repair or restoration of fixtures is one way to practice green plumbing, and can be much more economical than replacing the fixture or remodeling the room. I'm a plumbing-geek. I love to repair fixtures. But I'm always mindful that the fixture serves the customer, and so do I. My mission as a plumber has always been to be a servant of my customer. And my personal philosophy has been that my needs will be met by serving the needs of others. I hope the information you find here on Plumbing-Geek meets your needs. Whether you do your own plumbing or choose to hire a plumber, good luck with your project! If you're a plumbing geek, or only have a specific need right now, I think you'll be happy with the information on this website. Please contact me with any questions or comments.